The Hwasong-12 is road-mobile and similar in design to the Musudan intermediate-range ballistic missile. However, the Hwasong-12 is without stabilizer fins and, according to expert speculation, potentially equipped with a new and more capable rocket engine; allowing the missile more accuracy and reliability than the Musudan. The engine for North Korea’s Hwasong-12 also appears to be “uniquely North Korean,” according to experts — potentially designed by North Korean engineers rather than being based on foreign components and/or blueprints. 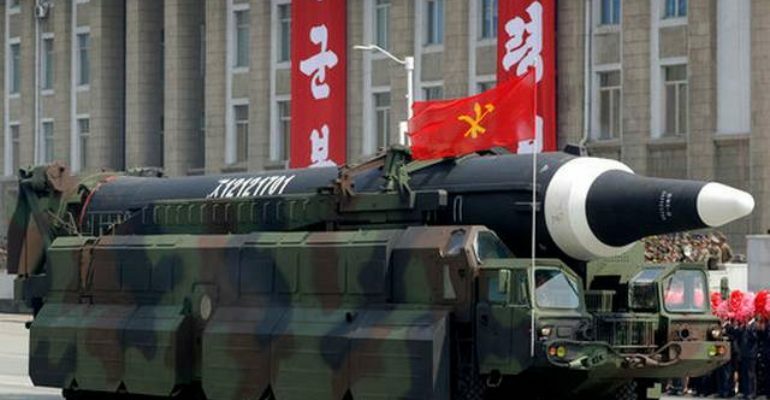 Experts speculate that the Hwasong-12 has one-stage, and the missile’s nosecone closely resembles that of the KN-08, North Korea’s intercontinental ballistic missile (ICBM) prototype. Click here to watch footage from KCNA showing the test launch of the Hwasong-12 on May 14,2017. If operational, the Hwasong-12’s 4,000 km range indicates the missile can be used to strike all of Japan or South Korea. Also within the missile’s range are U.S. military installations in South Korea, Japan, and Guam. North Korea’s successful test of the Hwasong-12 on May 14, 2017 demonstrates marked progress on the country’s indigenous ballistic missile capabilities. The missile’s lofted trajectory during the May 14 test enabled the North Koreans to measure the Hwasong-12’s reentry vehicle capability, and given the missile’s landing in the Sea of Japan, it can be inferred that the reentry vehicle performed successfully. Moreover, experts speculate that technology used by the Hwasong-12 could be reconfigured to support North Korea’s longer range missiles, such as the KN-08 ICBM. If North Korea can indigenously design and produce long-range missiles such as the Hwasong-12, Pyongyang may be only a few years away from indigenously developing an ICBM capable of reaching the United States; much sooner than previously estimated. Gerts, Bill. “North Korea Tested Warhead Reentry in Latest Missile Launch.” The Washington Free Beacon. 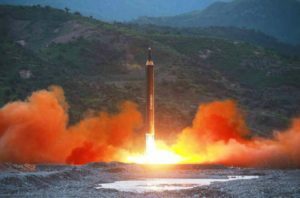 May 15, 2017. http://freebeacon.com/national-security/north-korea-tested-warhead-reentry-latest-missile-launch/?utm_source=Freedom+Mail&utm_campaign=c9ef585a9a-EMAIL_CAMPAIGN_2017_05_16&utm_medium=email&utm_term=0_b5e6e0e9ea-c9ef585a9a-45956469. Kim, Jack and Ju-min Park. “North Korea’s latest missile launch suggests progress toward ICBM: experts.” Reuters. May 15, 2017. http://www.reuters.com/article/us-northkorea-missiles-idUSKCN18A12B. McKirdy, Euan. “North Korea’s missile launch: What do the images tell us?” CNN. May 16, 2017. http://www.cnn.com/2017/05/16/asia/north-korea-new-missile-type-analysis/. Johnson, Jesse. “North Korea says new, longer-range missile can carry ‘large’ nuclear warhead.” The Japan Times. May 15, 2017. http://www.japantimes.co.jp/news/2017/05/15/asia-pacific/north-korea-says-missile-launch-aimed-testing-carrying-large-nuclear-warhead/#.WRmmsWjyvIU.